In Japan, there is a custom whereby the graduating students of a high school, after the graduation ceremony is over, run into the main courtyard and throw eggs and flour at each other. My informant spent most of her life in the city of Naha in Okinawa, Japan, and participated in this custom at the end of her three years at Shuri School. She said that all except the dullest of students participated, and that there were always a few students assigned each year to buy the eggs and flour for the entire graduating class. They’d throw indiscriminately until everyone was covered in doughy gunk. Friends would oftentimes chase each other around. My informant said that it must have been the freest time of her life, and a time she couldn’t look back to without nostalgia. There was all the anticipation and excitement for the future, she said, and she remembered how freely everyone was laughing, so incredibly happy if only because, deep down inside, they knew they’d be leaving each other soon. In a way, this custom would be the last ritual of high school they would be able to exercise. But how had this custom come about? My informant said that it was probably because the graduates wanted to celebrate their new-found freedom from the school system. Japanese schools are traditionally very strict about their dress codes, requiring uniforms from pre-school on to the end of high school. The uniforms come to define the students by the school they go to, and are symbolic of their obedience and compliance to the educational systems of Japanese society. Many students, even back in the seventies when my informant when to high school, must have felt some frustration for these rules, and for the lack of freedom that this allowed their individuality. In most schools, my informant said, there were and still are, rules about the length of girls’ hair, and the color of students’ socks. Therefore, throwing eggs and flour after the graduation ceremony and ruining (if only temporarily) the uniforms that had defined them for three years is a form of modest, socially acceptable rebellion–all in good fun, the students’ way of saying to their teachers and to the school, we don’t need to listen to you anymore! Since there’s probably nothing that causes more of a mess and is as easily obtained as eggs and flour, this exact custom had come about. Strangely enough, when I was telling one of my Korean friends about this custom, he told me that his friends in a Korean high school had done the exact same thing upon their graduation. It seems, then, to be a custom in some or all parts of Korea as well. Perhaps this custom is something that runs as a common thread between Asian countries because of the widespread use of school uniforms, and strict school policies. Similar to the way that American high school graduates throw their caps in the air after their graduation as a small form of rebellion and show of their independence, Japanese and Korean students throw eggs and flour at each other to mark their freedom from the uniforms that had defined them for most of their youth. In Japan, students nervous for a presentation are often told to draw the Chinese character for “person,” 「人」three times on their hand. They are then supposed to pretend to eat those “people” by putting their hand in front of their mouth, in the belief that this will ease their anxiety. My informant spent most of her life in the city of Naha in Okinawa, Japan, where her mother informed her of this folk belief when she was in middle school, preparing to give a speech in front of her whole class. Her mother drew three broad, sweeping 「人」characters on her hand and said, “now eat them.” The idea was that those three 「人」characters represented the audience in the palm of her hand, and eating them made them seem irrelevant, undeserving of her anxiety. My informant said, however, that it was less the actual gesture and more the fact that it invoked her mother’s continuous caring, that soothed her when she saw the characters on her hand while giving her presentation (and subsequent nerve-wracking situations after that). Because it is widely known and understood to be a prominent folk belief, she said, it gave her a sense of camaraderie with her audience–that she was connected to them even as she stood in front of the class, because she knew that many of her classmates had learned the same tactic from their parents as well. This folk belief is influenced obviously by the Chinese characters in the Japanese language. Each Chinese character possesses a meaning independent of sentences or words, and can be used alone to convey messages and serve as symbols. The three 「人」characters, as mentioned earlier, illustrates a literal crowd in the palm of one’s hand, at once minimizing the audience and making the performer feel more in control–the palm of the hand is a very controllable space, after all. Pretending to eat the audience only empowers the performer further, by giving them an opportunity to at least fake power over their own anxieties and the judgments of others. My informant mentioned, furthermore, that in her time in the seventies, the 「人」characters on her hand had served as a kind of symbol for wishbones as well, supposed to give the performers good luck–so the characters served a double purpose. By now this practice has become so widespread around Japanese society that, my informant said, nobody really knows where it originated from. She had heard it from her mother, who had heard it from her teacher, and so on. Most importantly, however, this highly ritualistic gesture is something that is performed usually in anxiety-ridden situations. When one is under a great amount of stress, even half-hearted trust in a certain folk belief can be enough to soothe one’s mind immensely. My informant said that, depending on how nervous she was, the simple act of performing that gesture repeatedly could calm her down, if only by reminding her of the futility of worrying, and of her mother’s support. 「交換」(koukann) in Japanese means exchange, and 「日記」(nikki) means journal. Together they mean exchange journal, although, in fact, it is more of a sharing journal than anything else. In Japan, girls in the later years of elementary and early years of middle school often participate in a game of sorts, where a group of about three or four pass around a journal amongst themselves. One girl would have it in the morning, write something about her day, and give it to the next girl during lunch, who would pass it to the next girl after-school, and so on. My informant has spent her entire life in the city of Naha in Okinawa, Japan. Okinawa, among other things, is known for its stationary residents; my informant barely knows anyone that has moved houses at all in their entire lives. Because of this characteristic, she said, she spent her school years, from elementary to high school, with approximately the same group of people.「グループきつくて、友達とかも大変だったよ」are her exact words, which translates roughly to, most times, friendships were (for good or bad) claustrophobic and exclusive. In this environment, which perhaps mirrors the environment of most Japanese schools in an intensified form, my informant had 交換日記 with two of her best friends. The 交換日記 was used mainly to tell secrets they were too afraid to say out loud, or to refer to inside jokes and stories that cemented them closer together as a group. For instance, said my informant, one of her best friends only ever openly gushed about the boy that she liked in the 交換日記, never breathing a word about it out loud. That was an unspoken rule about the 交換日記, in fact–the journal and real life existed, essentially, in two separate realms, and by some unwritten law they all knew that they couldn’t actually talk about anything that was mentioned in the journal, unless the person who wrote it brought it up herself. There were a lot of unspoken rules like that, my informant said, to make them feel like they were participating in something secret, a covert organization of some sort, although every girl around them was doing the same thing. The style and content of the 交換日記 were highly ritualized, she said. The journal was always the same standard, seventy-page school-use notebook, the one that basically every Japanese student used, and still uses. The cover was always decorated to the utmost; in their case, they had glued sequins and glitter all over the front, and an applique of a butterfly, making it shiny and girly and unrecognizable (the butterfly, she said, was because they had inside joke about it which she has since forgotten). On the inside of the cover they had written down the rules for the 交換日記, as all exchange journal groups did. Their rules dictated that each girl had to at least draw one picture of something detailing their day in their journal entry, no girl could withhold information about a crush or a potential crush, and each entry had to be at least a page long. The most important rule consisted of having to hide the actual physical exchange of the journal from all others. Other groups made other rules, but these were theirs, and it defined their 交換日記. My informant went through six notebooks with the same group of friends before they decided to stop. She said, however, that she knew girls who would get in fights with their friends because they were participating in more than one 交換日記 with different groups of friends. The one thing about the 交換日記, she said, was that it exhibited all the drama and self-consciousness of being a pre-teen/teenage girl in Japanese society. The 交換日記 is indeed largely reflective of the school life of girls in their elementary and middle school years. My informant grew up with the same group of people, and for the most part, the same group of close friends, as do, it seems, most Japanese children still. The 交換日記 illustrates the girls’ desire to define themselves away from the rest of the school population, to create a distinct, close-knit little society governed by its own rules. It also indicates precisely how claustrophobic the school environment can be; with these close-knit groups and their secret journal societies, how is a newcomer supposed to integrate into the school? My informer said, in fact, that it must have been very difficult to be any kind of an outsider. Get on the wrong side of your friends, and you were out–and being out meant you had to find a way into another group, which was always extremely difficult, especially with girls, my informant said, who were very territorial about these kinds of things. This seems to make sense in a homogeneous society like Japan’s, where students, eager to distinguish themselves from the crowd, create friend groups as foundations for their identity, relying on these friendships to set them apart because, in all other aspects, everyone is usually relatively similar. There were prestigious 交換日記 groups that everyone wanted to be part of, for instance. And then there were ones like the my informants’, created merely for fun and for advancement of their friendships, but still possessing an intense, intimidating undercurrent of exclusivity. My informant, who has spent her entire life in the city of Naha-shi in Okinawa, Japan, was extremely surprised when I told her of the apparent strangeness of this folk speech. Her mother has always called her husband (and my informant’s father) “father,” and her father has always called his wife “mother.” It was always perfectly natural for my informant and for everybody else in Japanese society to hear parents talking to each other as if they were each other’s children. Though they refer to each other by their names occasionally, they very rarely stray from this folk speech, which seems to characterize the relationships between most parents in Japanese society. Though Japan has a very low divorce rate, research has shown it to have one of the highest percentages of unhappily married couples in the world. This percentage, though partly a result of women lacking the economic independence to free themselves from an unhappy marriage, also arises from the prominence of children in Japanese married life. According to my informant, many a Japanese couple, after they have children, shift towards investing their entire life and love towards their children, becoming not man and woman but “father” and “mother,” defining themselves solely by their positions as their children’s caretakers. When my informant came on an extended visit to America, she was perplexed to see, on some American TV show, an episode when the parents leave their kids with a baby-sitter and go off on a night of their own. The concept of a baby-sitter barely even exists in Japan, where usually women serve as housewives and are always home, and where the possibility of leaving the children behind to go on a date as man and woman feels like some kind of betrayal of the family system. 「結婚したらロマンスなくなるよね〜」was what my informant’s mother had said, which, roughly translated, means You can’t expect the romance to keep going after you get married and have kids. That parents have–always, it seems–called each other 「お父さん」 and 「お母さん」referring to themselves only as “father” and “mother” in relation to their children, seems understandable then, in the context of Japanese society. Perhaps this folk speech derives itself from the very culture and sensibilities of the Japanese people. In Japan, perhaps, nurturing children and creating a cohesive family with clearly defined roles is seen as more important and easier, perhaps, than a passionate love between parents, hence the reason why so many people disregard their names (and subsequently, perhaps even their individual identities) to adopt the generic roles of mother, and of father. The “Journey to The Underworld” was an event organized by the JCL (Junior Classical League) at my informant’s high school, where the freshman Latin students were forced to undergo certain initiation rites to cement their entrance into the club. My informant went through this process as a freshman and later, as club vice-president and upperclassman, even organized the event. The rites were, of course, heavily influenced by Latin mythology and pieces of Latin folklore. The upperclassmen had somehow procured a toilet a few years earlier, and they filled this up with all manners of things (clam chowder, peppers, raw eggs, soy milk, cottage cheese, etc. ), changing it up every year to make it as disgusting as possible. They then made blindfolded freshmen root around in the mess in search for a quarter that they always “forgot” to put in the toilet bowl–the quarter an obvious allusion to the coin needed to cross the River Styx in the Underworld. The upperclassmen would then draw on the freshmen with felt tip markers, saying, “Cerberus is licking you!” referring, of course, to the three-headed dog that guards Hades. Throughout the entire event, freshmen were to be remained blindfolded and upperclassmen led them around, oftentimes in circles, pointing out various spots in the “underworld” to dramatic music and sudden bursts of screams. Although the rites changed from year to year, they were generally light-hearted and humorous, and even the freshmen were happy to go through the experience, seeing it as a way to bond as a club and get to know the other members. Afterwards, they would hold a banquet and a bonding movie session, where the newly initiated freshmen would sit as one and the same with the other members, and interact with them essentially as equals. The food at the banquet, my informant said, was usually store-bought or home-made by the upperclassmen, in this way allowing the freshmen the privilege of being served by the same people who had scared them not an hour prior. Perhaps in this way they restored balance, and brought cohesion to the club as a group. These rites served the purpose of something like an initiation; all the non-freshmen had gone through that event at one point in their club career, and so the freshmen weren’t fully members until they had endured the same–the same mentality that pervades fraternity and sorority culture. It was also a way for freshman to bond with each other, through shared experiences, and with the upperclassmen, whose enjoyment in the teasing and scaring had more to do with the hopeful anticipation of the coming class more than anything else. “There was this boy like about our age, and he had a fight with his mom and ran away and supposedly slept at the nature reserve. Oh, he was from Milton, which was like another elementary school near us. I mean I don’t think I really believed this at first, because the nature reserve can be freakin’ scary at night. But anyway, I was in elementary school and I was like, whoa. So he was trying to get to sleep in the nature reserve, and uh, he was under this tree. He’s getting kinda scared because it’s freakin’ dark and like, it’s windy so the trees are making weird noises and stuff. And he looks up, and he sees this white owl sitting on the branch on top of him. No one sees white owls, you know? I haven’t, anyway. Well, there’s this white owl, and it looks sort of like Hedwig from the movie, like it’s big and fat and has those grey markings. So this boy’s read Harry Potter and he thinks, holy crap, it’s freakin’ Hedwig. And even though it’s dark and super windy and the branch keeps moving back and forth, this Hedwig owl is so calm and like, the boy isn’t as scared anymore because he feels like Hedwig’s protecting him. So uh, he goes to sleep I guess, and the next morning he wakes up right, and he finds the Hogwarts letter like sitting right next to him! Like the one telling him “Welcome to Hogwarts” and stuff, like, “you’re a wizard, yay!” Which is pretty much what everyone in my elementary school wanted at that point, you know, we were like all of us about the right age. Uh, anyway, he opens the red seal thing, and he reads it, and he’s super-excited and forgets about the fight and goes home to his mom, but she doesn’t believe him. She doesn’t even believe he slept over at the nature reserve, she thinks he’s just saying that to make her feel guilty for the fight, and obviously he doesn’t believe her about the owl. The boy goes around telling his friends and stuff, but before his friends could ask him about it and stuff, he just up and disappears. The next day, like, his mom comes to wake him up for school and he’s gone, and nothing’s gone but the window’s open, and that’s when she realizes she should’ve believed him. No one knows exactly where the legend came from, but my informant said she had heard it from a friend who had heard it from a friend who went to Milton Elementary School, where the boy had supposedly gone to school. There were some people who believed it, she said, but most people did not, if only because the nature reserve was perceived to be so frightening at night that no one would ever go there to sleep alone, and because in a small town like that, such a police investigation would have been the talk of the decade. However, the most significant aspect of the story wasn’t, or isn’t, its believability, but more the rituals it spawned. Although the legend had initially circulated amongst elementary schoolers, it eventually found its way into the collective imagination of middle school and high schools students, who began to use it to create ritualistic events. For instance, my informant said, there were always a group of foolhardy middle school kids that would make it a point, over the summer when they were bored, to camp under different trees a few nights in a row, to see if they could find the right one, “The Hogwarts Tree.” Even in high school these sort of ritualistic events proceeded, with high schoolers doing the same thing or being even more clever by daring someone to sleep under a tree alone. At one point, my informant said, when the legend was at its peak, there would be twenty or thirty groups of different middle schoolers and high schoolers (sometimes with parent chaperones, although these were the “lame” groups) grouped under different trees, using “The Hogwarts Tree” as an excuse to camp out in the middle of the nature reserve. It became fashionable to say that they had spent the summer looking for “The Hogwarts Tree,” and oftentimes people told stories of how they had come so close to finding it. The town police had, apparently, turned a blind eye to the proceedings, seeing as how it was all some kids having fun, up until high-schoolers and college students began drinking in the reserve, having secret Hogwarts parties that my informant did not know about until she was a high-schooler herself. These and the other groups petered out as the police began discouraging them from camping in the reserve. There were still some people that ventured into the reserve to look for “The Hogwarts Tree,” but these were random groups, usually college students looking for an adrenaline rush. This legend arose, obviously, from elementary school students’ obsession with the Harry Potter books–especially because they were of the right age to receive the letter from Hogwarts that would supposedly proclaim them a wizard. Every reader of the Harry Potter books has wanted to become a wizard, and this desire is perfectly captured in this story, which entranced first elementary schoolers, and then those older, indicating that nobody is too old for some literary escapism, or to want an excuse to camp out in a forest without parental supervision. Looking for “The Hogwarts Tree” perhaps gave them a sense of higher purpose that elevated the event beyond the traditional experience. 「三日坊主」is a phrase in Japan that, translated literally, means “three days monk,” or “a monk for three days.” It is used in everyday speech to indicate someone that gives up at the first sight of difficulty, or gets so easily bored with something that they are always hopping around one thing or another. For instance, someone that can never keep a journal for longer than a few days is said to be a 三日坊主, as well as people who pick up a new hobby every month. When my informant asked me whether there was an American phrase that corresponded with 三日坊主, I was surprised to find that I couldn’t give her a set answer. The closest phrase I could come up with, “easily bored” doesn’t have that same sense of giving up at the first sign of difficulty, the sense of wanting everything to be easy, that 三日坊主 implies. 三日坊主 is a phrase with mostly negative connotations, yet many people use it to describe themselves, oftentimes saying jokingly something like, “Oh, I quit needlework classes a long time ago. I’m such a 三日坊主!” Using a phrase like “three days monk,” perhaps, has a humorous aspect to it that makes it okay to joke about what could otherwise be seen as a character flaw. This way, in fact, they don’t need to discuss and talk about the reasons behind why they are so keen on giving up–labeling oneself as a 三日坊主 seems to be enough explanation by itself, and probably the reason why people find so much comfort in the phrase. The fact that the phrase exists gives a sense of camaraderie to all those who are described such, making them feel part of a pre-packaged group. 鏡餅, literally translated from the Japanese, means “mirror rice cake.” This name, though thought to have originated from the mochi’s resemblance to a old-fashioned kind of round copper mirror, has no relevance at all to its folkloric aspects. 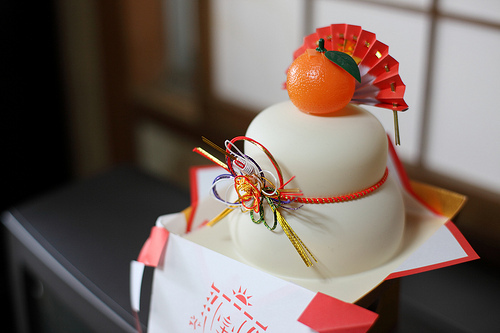 鏡餅 is a traditional Japanese New Years decoration, consisting of two round mochi (rice cakes), the smaller placed atop the larger, and a Japanese orange with a leaf placed on top. My informant is a student in Nagoya, Japan, and has had 鏡餅 decorations every year for New Years, for as long as she can remember. Recently, however, she said that her family has settled on buying the cheaper, mass-produced 鏡餅, which are often pre-moulded into the shapes of stacked discs and sold in plastic packages at the supermarket. A plastic imitation bitter orange is substituted for the original. In some cases, there are actual rice makes within the plastic casing; however, even if there is, she said she has not heard of many families who actually enjoy eating the mochi. “Because it’s been there for so long,” She said. “It gets all stale and gross and no one wants to touch it.” The plastic casing, however, is preferred by most contemporary people because it keeps the mochi inside free of rot and germs. They break open and eat the mochi usually on January 11th, in a ritual known as 鏡開き (which literally means, “breaking the mirror”), in order to celebrate the breaking of the old year, for the arrival of the new. By this point, the mochi has become so stale that it usually has cracks on the surface; however, because cutting it with a knife has negative connotations (cutting off ties), they usually crack it open with their hands or some other heavy object. The two mochi discs are said to symbolize the coming and going years, as well as the balance of yin and yang, although most people, including my informant, do not know exactly how those two concepts apply to the structure of the 鏡餅, or why it has to be mochi at all–it is simply something a ritual they have performed in the past, and so they repeat it, to end their year on the “right note,” and to enjoy a sense of camaraderie with the rest of Japanese society. My informant goes to high school in Tustin, California, where he is currently a junior. A few months earlier, he had heard of a legend of a senior prank that had occurred perhaps ten or so years back, where they had flushed all the toilets at the school at the same exact time to see what would happen to the plumbing. They had these stopwatches, right, and all these walkie talkies, and they pressed the stopwatches at the same time and flushed the toilets just as the timer went down to zero. They wanted to see if a pipe somewhere would explode I guess, but then, instead, two toilets just blew up. Uh, I think one was a female staff toilet, and the other was in one of the main guys’ bathrooms. The toilets just like, blew apart, all the porcelain and whatnot. Which was fine and all, except later when they were trying to clean up the exploded toilets, the fixer-upper guy found a hole in the wall of the bathroom and looked through it and there was uh, a dead body in there, like scrunched up and still fresh-looking, like a girl just crawled in there and curled into a ball and died or something. Anyway, he thought she was dead, but then he’s staring at her and he can’t move because he’s so freakin’ scared, and she turns her head towards him kind of, and she doesn’t have eyes, like they’re just sockets on her face, and in the sockets there’s one of those millipede things that comes crawling out. Anyway, the plumber guy told everyone but nobody really believed him because they checked later and it was gone, but still. And they fixed the toilets and stuff, but man. The guys’ bathroom is a freakin’ scary place. I feel like the legend is significant because it pits teenagers, most of whom think of themselves as invincible, against death, even if it is a very unrealistic and cinematic depiction of it. School is a place for boredom, for homework and tedious routine–to introduce a corpse into such a scene is jarring, and sets the entire nature of their everyday lives off-balance. That the legend became so widespread, however, is not surprising; people like a good scare, and school is a place of boring routine. Although my informant and his classmates probably thought this legend was very original, there are probably many, many legends of something similar to this in schools all across the world. What is a vampire’s favorite drink? This is funny because 코피 in Korean means nosebleed, while the way it is pronounced, kopi, sounds a lot like the English word coffee. So while the real answer is nosebleed, kopi adds another dimension to it by making it sound like vampires like coffee. In this case, the audience would need to know English to understand the question, but also the Korean word for nosebleed, and understand that its humor comes from kopi‘s similarity to an English word–a complex, bilingual understanding. Which celebrity likes to hold the most luggage? Now this is one that, if you did not know better, you would think was an American joke because of the lack of Korean words. However, this is only funny because Jim (or jeem) in Korean means, more or less, “luggage,” while Carrey just sounds like “carry.” Jim Carrey’s name in Korean-American terms then, could be seen as Luggage Carrey. These jokes are deceivingly simple, actually requiring a pretty advanced understanding of both languages for them to be immediately funny, as they are supposed to be (my informant could not stop laughing while he told these jokes, while I stared at him blankly, especially the second one). In that way, it can be seen almost as a rite of passage, or a kind of test, for Korean-Americans. To be truly bilingual, to be truly Korean-American, is to be able to understand these kinds of jokes. The fact that these jokes exist at all, in fact, makes it clear that Korean-Americanism is its own culture–that Koreans living in America are not just displaced peoples, losing their culture to America, but an entirely new, emerging culture that thrives on its distinction from both Korea and America.